Over recent years public transport has clearly improved, as can be so easily observed by looking at the ridership figures. Yet, while it has improved and more improvements are on the way, it often feels like the system is let down by making it unnecessarily hard for users. Here’s one example I’ve been experiencing lately. First a little background. One of life’s little ironies is that as one of the biggest supporters of the City Rail Link, I’ve probably been one of the most impacted by the disruption that building it is causing. I work in Takapuna and prior to the CRL works my commute would involve catching a train to town, a short walk to Albert St where I could catch a bus that went directly to Takapuna. It was the same in the reverse direction. I also wasn’t the only one and noticed a lot of others doing the same. It wasn’t uncommon coming home to see almost half of a full bus get off at Lower Albert St and walk through the old mall and in to Britomart. With the arrival of the CRL works all that changed. 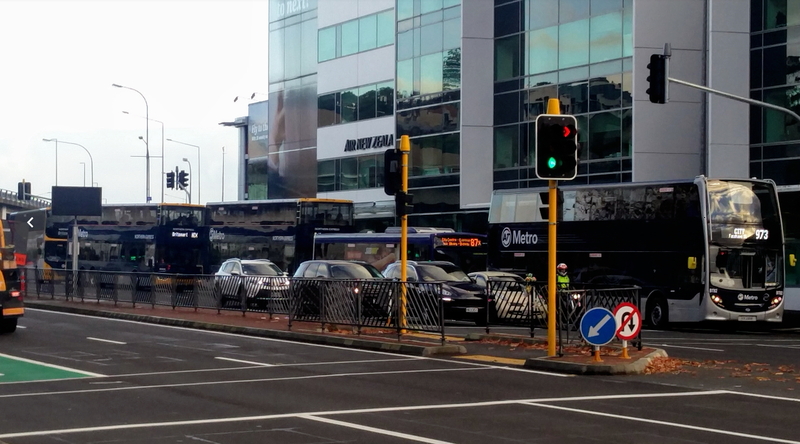 The buses that I used to catch that go direct to and from Takapuna now avoid the going anywhere near Britomart, instead travelling along Wellesley St. This means that to get to work via PT I have two main options, catch a bus and transfer to another bus at either Victoria Park or Akoranga Busway Station. Either option it involves a fair degree of good luck with the timing of connections and so it’s no surprise I see hardly anyone doing it anymore. Most of the time I now go for option 3, I catch a Northern Express between downtown and Akoranga where I’ve left my bike and I ride the short distance to Takapuna. It’s more reliable and normally faster but for various reasons I’m not always able to do it. A good and relatively easy solution would be to send all of the Takapuna buses via Akoranga busway station to remove the need to gamble with where to transfer. It wouldn’t solve all issues but would help. Unfortunately, even with the yet to be rolled out new network for the shore it’s not planned to happen. Since the CRL related changes, buses from Takapuna still use the Air NZ stop, before changing lanes to allow them to turn right onto Halsey St. The Northern Express (NEX) and Birkenhead buses use a newer stop 160m further down the road, near the Fonterra building. In between these there is also a City Link stop on the corner of Daldy St and Fanshawe St. These locations are shown below along the stop outside the KPMG building further along Fanshawe St, I’ll explain the reason for that shortly. In the new normal course of events, to get to Britomart if catching a bus from Takapuna I’d need to get off at Air NZ and either cross Daldy St to get a City Link or walk a bit further where I could transfer to a NEX or Birkenhead bus. Mobile apps to track where buses to make the best decision have been invaluable for this task. That doesn’t mean it’s been smooth sailing though and it’s no surprise others don’t do it. Closing the Fanshawe St driveways to the former petrol station and moving the NEX stop closer, along with some good comms, could help make this transfer much much easier. Recently, AT’s apparent disdain for PT users has reached epic new levels with the situation having been made even worse thanks two separate pieces of work. First, works on Daldy St have seen the City Link bus stop closed. This has seen the City Link services temporarily diverted to use Halsey St meaning the closest stop is the KPMG stop mentioned above. That’s a pain but given most of the time I walked to the Fonterra stop due to there often being more frequent buses, it wasn’t terminal. But this week things took a turn for the worst. Thanks to work by Watercare, the Air NZ stop has now closed too and the Takapuna buses that once stopped there have now been diverted down Beaumont St. That has resulted in the first bus stop in the city for these buses being a patch of shoddily laid bit of asphalt next to the skate park. To get to Britomart now involves a 350m walk to the nearest stop across three sets of traffic lights (two on Fanshawe). That’s not making things easy on a good day, but throw in some wind and rain and it doesn’t make for a fun time. That AT could even consider such a customer unfriendly move beggars belief. Perhaps the people from AT involved in making this decision need to be made to experience it a few times. The transfer between the stops is shown below. Of course, ultimately the CRL will help address this to some degree as buses that go via Wellesley St would allow for transfers at Aotea. All of this isn’t to say that AT shouldn’t make temporary changes for works. But they do need to put more (or even some) consideration into the impacts that changes like this have on their customers. There are probably a lot of examples, both temporary and permanent just like it. Fanshawe St is a particularly good example because of the volumes. As of last time I saw any numbers (before the double deckers arrived), about 70% of people arriving to the city on Fanshawe St in the morning were on a bus. Yet, time and time again when works are needed we’ve seen ATs first choice being to inconvenience bus users. Stop making PT so hard Auckland Transport. Firstly Matt, I salute you for your sheer determination to keep using using PT when it seems almost purposely stacked against you. Any lesser man would have quit long ago! Secondly, and not to make your obstacle course any more difficult or anything, but it’s been about six months. Isn’t it about time they dug up Halsey Street again? For new network west, there are a ton of routes that leave just minutes before the train or connecting bus arrives, meaning you have to wait 25-55 min for the next one. Why are these not timed properly? Obviously timing them properly isn’t going to always work and there might be other connections to cater to but it seems to be a consistent issue, even at the major interchanges. The other issue is stop spacing, some of the new route have a ridiculous amount of spacing between stops, meaning people have to walk for ages even though they live along the route and drivers are not allowed to let them off or they might get fined. I understand it takes time to install a RP5 sign and some line markings but why not just throw up some temporary bus stop signs in the interim in safe locations. Also early running buses are HELL, it makes it so difficult to use buses, especially in a more connected network like the new network is supposed to be. Fix this AT! This is a capital offence for bus drivers anywhere but in Auckland it seems. The 715 runs early 80% of the time and late the other 20%. With it’s low frequency it means you have to be at the bus stop 10 minutes before ETA and might have to wait another 15 after. Last time I mentioned the driver that he was 5 minutes early and I’ve been reprimanded by a superannuitant. Because in his mind for the people already in the bus they don’t care if others miss it. Yeah I have noticed that too, personally I feel more comfortable waiting and knowing people can actually get the bus at the timetabled time rather than leaving early and those people missing the bus. Surely when you board the bus at X time you don’t expect to get there before the timetabled time anyway, so whats the issue? I guess some people just don’t get the *public* part of public transport. Fine, but then don’t ever have me arrive late either. Pluses and minuses cancel out with earlies/lates. If you arrive right at the scheduled time, that’s your risky decision. Nah, I disagree. Particularly with multi-stage journeys, you can make other plans if your first bus was late. If the second bus has already left, you often don’t even know, and are waiting for nothing. Only in terms of on-bus travel time. In terms of total journey time including waiting, they exacerbate each other. If the bus varies between 5min early and on time, you have to arrive 5min early, with waits of up to 5min. If it varies between 5min early and 5min late, you still have to show up early, but you’re waiting up to 10min, AND you probably need to aim for an earlier bus to accommodate the risk of lateness. This obviously gets more annoying with higher variability and lower frequency. I’ve learned through bitter experience that if I need to be in town early on a weekend, the timetable is only theoretical and I need to be at least 10min early, or I might be waiting half an hour for the next bus. I spent *years* catching a very, very early bus, and I learned to always be a few minutes early because there wasn’t another one for 30 minutes (AT hates earlybirds). As long as it ran to time, it was fine, but if it was late it threw off everything. This is exactly why we need bus lanes on all FTN routes as soon as possible. “Better late than never”, certainly. But “better late than early” means the same thing, because if you’re on time and it goes early, you’re never going to catch it! Many PT operations (particularly rail) do not permit early departures. Early departing gives the impression of unprofessionalism and a “customer-be-damned” attitude, unless frequencies are so high that timetables simply don’t matter. The resultant unpredictability is one of the things that tend to make bus services less-attractive than rail. Of those operations where early departing is permitted, many limit it by having key nodes at which timings are enforced, and early-departing is only allowed at intermediate stops between. The key nodes prevent an accumulation of earliness, but this begs the question, why bother to leave early in between? I don’t know what AT’s policy is, but to me, early departing is a no-no. If the timetable relies on early departing in order not to run late elsewhere, then it seriously needs revising. @Dave B, Yes totally agree, I wonder how their latest stats show the buses being so on time, obviously not measured the way we think they are, seems hard to believe from a lot of people’s experiences & what I hear. Yes, and for exactly the same reason that it’s not acceptable for buses to run early: the harm caused to people left waiting at the stop for the next bus outweighs the benefits to passengers already on the bus. Cure lateness with bus lanes, not by screwing over other passengers. Also, we’re not talking a minute or two early – I agree it’s foolhardy to be exactly on time at the stop. But we shouldn’t have to be five or ten minutes early just in case the bus was having a good run. The network needs to work for people who don’t carry computers around with them. Think you have it tough with the CRL works? Just wait for when the station and grade separation works at Mt Eden closing the Western Line for 2 years starts! That will put your having to walk for 3 – 4 mins into perspective. Wow, 2 years of closure? I hate to think of the chaos that’ll cause. Is there an implementation plan online anyway for this? Will there be 24/7 bus lanes replacing the rail for that period? It will not be a full closure, it will become a single line again past Mt Eden. Yes, AT have been very quiet on that. My understanding is that it wont be a complete closure but that there will only be one track running through the worksite meaning 20 min frequencies will be the best that can be maintained on the Western line. Sounds like a great opportunity to make get rid of some if not all of the rail crossings on the Western Line at the same time. Maybe trench some stations, build bridges, close roads etc. great opportunity indeed, looks like an excellent opportunity to remove the Glenview Rd crossing in Glen Eden has been ignored and will probably be made impossible as work has started on a pair of 10 story single bedroom flats using up the vacant land between the fire station and railway line. Glenview Rd is a long way from Mt Eden and don’t expect it to happen anytime soon, it should have been removed as part of the double tracking. AT should run 10 mins freq Swanson-Kingsland and let ppl transfer to buses there. Only run low freq between Kingsland and Britomart. That way at least some of the functionality can be saved. I suspect that is what they will do. Have 6-car 20 min frequency running all the way to Britomart and 3-car 20 min frequency in between running to Kingsland, with bus transfers. This could actually be quite appealing to people working in mid-town, however this may be limited by the number of extra buses the CBD can handle. Last I heard there will still be 10 minute frequencies (in peak) with peak direction trains having right of way with the possibility of counter peak services skipping stations to stay on time. I have said it before but Auckland needs a CBD bus terminal. Accepting the cluster [email protected]#k that existed anyway let alone the mess now is simply not good enough. And of course we’ve lost Lower Queen St too! The vast majority of PT is carried by buses and yet the departure/ termination points are scattered randomly everywhere and anywhere. It is hopeless. One CBD bus terminal would be far too congested with the sheer volume of buses. But I do agree that there should be actual terminals there rather than just street stops. Can build them into a new development – one location would be behind the Aotea Centre at 4-10 Mayoral Drive which is currently a car park. Could dig down and build an underground carpark. Above this at just below/even with ground level you would have the passenger facilities and shops etc with the bus terminal directly above that. Then on top of that you could built up further with an office building or apartments. Multiple benefits (still keep the parking in place, get a nice passenger experience, get a place for buses to go rather than blocking up the street as their volumes increase, and you get to sell/lease out the building above to earn income). 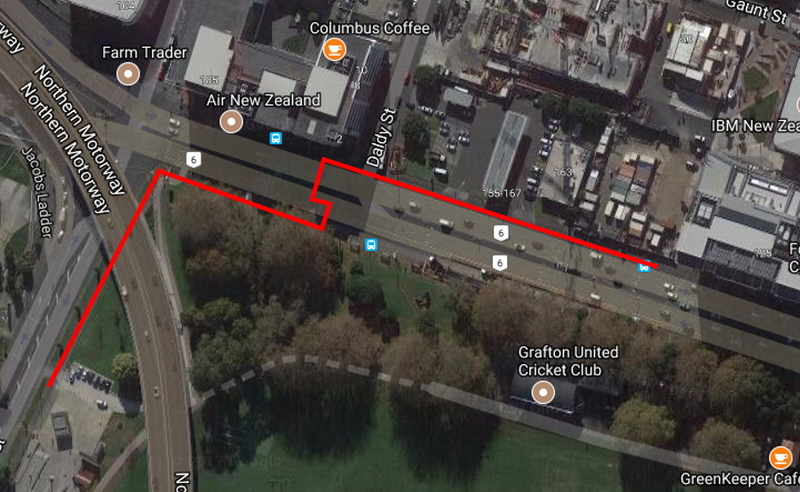 It is quite a central location so all the buses along Wellesley St would access it from there, it is also currently part of the CRL designation so could easily have access to the CRL from there for a seemless experience. I would love it if some of the people in the know on here could investigate something like this further? I really do think it could be a VERY good option for Auckland to take. Why not just stop the buses on Wellesley Street? We’ll have to get all of the cars out to get the buses throguh the Kitchener Street Intersection, so why not just use kerbside stops? and put an AT HOP machine and bus stop information at the intercity terminal, since every single incoming passenger is probably needing to catch an Auckland bus somewhere. Or do they want all those passengers to be picked up by car? +1 the site AklDude discussed is one that I have thought about for intercity buses for a long time. Transforming a car park into a terminal is genius. But it really has to be downtown somewhere otherwise the ferries and trains do not link and that is as bad. And shuttles do not work as witnessed by the old Beach Rd railway station. By the time such a terminal opened there will be trains more or less at the door, they would serve as the ultimate transfer to ferries. Wasn’t it part of Sky’s terms for building the convention centre that they had to build a bus terminal underneath on Nelson/Hobson? Really? Because they’ve shown they’re such good hosts to a bus terminal under the casino? Goodo. – To catch a bus from town you just jump on the ring route and get off at the stop it tells you for that route (‘This is alex evens street. Change here for Dominion road buses’). – It means no buses need to go through the city centre – so no need for any other light rail to remove buses from the city. – All inbound buses will effectively go to uni, queen street, britomart, etc. So instead of AT’s plan where every route meets every other route (just not in the same place), which allows all journeys through the CBD to be done with one transfer, you propose to force all cross city centre transfers to use an additional service? Not only that, but a full double decker from Dominion Road will terminate at Alex Evans and 100 people will get onto an LRT vehicle with the same thing happening for every route? I genuinely don’t think that an LRT vehicle per minute both directions would have enough capacity! If its every minute I would say it would be quicker to transfer twice than to have your bus slowly drive through the city. Remember people will also be getting off the light rail, and some people will go counter clockwise while others will go clockwise so maybe only 50 getting onto light rail per double decker bus. Why would your bus travel slowly through the city centre? Make them double deckers, enable all door boarding and paint proper bus lanes everywhere and they won’t be slow. Who knows? Because it just does? Because AT don’t care? So AT care enough to build an LRT loop and all of the terminal transfer points, but not enough to improve the bus lanes and build bus transfer points? Yep AT seem to only care about big projects. Things like bus lane hours, all door boarding, less stops, better signage and information boards, a single place in the city where you can go to catch a bus, bus priority – all don’t cost much and could have been done years ago. But not exciting enough. There is no real reason why the experience on a bus should be so much worse than a train. “So instead of AT’s plan where every route meets every other route” – when are they going to implement that? 2050? Why not tomorrow? Implementation post CRL. I don’t know why they are waiting that long. We could just close Wellesley St and Victoria Street to cars and do it now. I’ve often toyed with the idea in my mind of a central bus terminal in the CBD. Probably we would be better off with just a collection good quality transfer points with decent facilities. Seems AT is always on a shoestring budget, saving up for big projects, so a lot of little things get missed. We could possibly have both though, stops on Wellesley St as planned with the bus cross route there and other places but I thought of one not so central but fairly so for all modes in the current Farmers Tournament parking building area (corner of Wyndham & Hobson St). Upgrade the streetscape etc and re design the roads to make it work. Fairly central but perhaps not enough, but would suit intercity buses also. All the northshore buses could pass through here with either good bus priority or underground access. Would only be 370m to Aotea Station, less to Queen St. I think that there are several stations that are very user unfriendly by requiring people to walk and climb up and over long winding stairs and paths. Sadly I have a strong feeling that it is mainly younger people who use these stations as I rarely see older people there. eg. Papatoetoe, Penrose, Otahuhu, Puhinui, We need more easy ones like Glen Innes, Remuera, Panmure, Newmarket. Roadworks in a bit city are the norm. There always will be diversions, we have to accept that, but AT must try harder to lessen the impact on the users of PT. AT have all the data from HOP cards, they know exactly where the passengers are going and they should cater for those flows. Personally I find the disconnect in the middle of the city really annoying. I use West Auckland buses and the fact that they terminate right in the middle makes transfers a big problem. In a way that got exacerbated by the new network that has far more express buses that have only one stop in the city – 99 Albert St. Yes, public works are something we need to live with, but AT can do much more. The best solution is that the roads get closed to peak hour cars, to enable the space that is available around the works to be well utilised by buses. So 6 buses/trains to get to and from work per day. Seriously, who apart from the retired have that much of their life to dedicate to daily travel? Rather than fit in with AT and their useless bus stop locations why not drive your own car? Its appears that what they want! The city link doesn’t stop at the Civic! It stops miles away from the north shore buses. +1 Exactly. The appeal of rail is that it normally doesn’t vary, or get dispersed around the place in a confusing manner. Except when it gets replaced by buses that is! I understood the aim of the “Len Brown” PT plan was to have each PT stop within 5oom. Has that aim been changed? it seems that the 500metres is more important between the various intersecting services. Too close stops RUIN PT. The short gaps lead to constant stops – Carrington Rd is a great example. Fewer stops leads to a much more efficient running pattern. I thought that this plan was to have stops every 500m, not *at least* every 500m or *no more than* 500m. At least one section of St Johns Rd & Remuera Rd is a ridiculous example of having too many stops. Seem to be about every 200m. think my memory may be wrong. I think the aim was for everyone to live within 500m of PT! Sounds to me like you need a rail link to Takapuna. That would definitely help! Still there is a lot that we could do in the short term. Can you take bikes on any buses in Auckland, or is storing a bike at akoranga possible (is bike lockers)? You can take folding bikes on all buses in Auckland. You can take non-folding bikes on some Waiheke services. There are bike lockers at Akoranga, Smales Farm, Constellation, and Albany stations, however, the keys are brass, not stainless and are frequently bent so badly they no longer open the lockers. Bike racks and shelters at the bus stops might help reduce the heavy parking we’re seeing in the suburbs near the bus stops. It’s making cycling for kids more dangerous. Wow. That’s very European. Here the bus drivers sometimes don’t even take mothers and pushchairs. +1, I’ve had drivers refuse to take schoolchildren because ‘they should be on the school bus, not in the way of real commuters’. Yes that was happening in Pt Chevalier but the bus drivers got a rark-up for it. I had to intervene to help a deaf and mute mother who was being refused entry to a bus simply because there was already another pushchair on the bus. Both pushchairs could be folded. Stupid lazy driver. An Onewa station would help with this and many other transfers (eg to Ponsonby bound buses). They should put in a basic version now with the existing underpass.